Bewildered by the imposing blocks of verbiage-laden text that comprise the typical FDA marketing guideline? Us too. In the spirit of mutual de-befuddlement, we present the first MM&M annotated guide to the most essential DTC regulations and requirements. At the heart of all DTC drug ads — requires broadcast drug ads to state the most often reported side effects and contraindications (e.g., negative interactions with other medications or disorders). Info must, at a minimum, be spoken or voiced-over in the ad. *NOTE: pharma still runs afoul of this — of the 7 warning letters issued by the FDA in 2018, 3 related to violations of the risk-info rules. **NOTE: By contrast, print ads require a “brief summary,” which is actually far longer! The Code of Federal Regulations lists 33 ways* in which the risk information can be “false, lacking in fair balance, or otherwise misleading.” YUP! *Some address the misrepresentation of clinical-trial data (e.g., using data from tests on “normal” people when the drug isn’t used by “normal” people). Others include the use of out-of-context quotes and a failure to present the risk information prominently. The last time a company was warned for a DTC TV ad was in May 2017 when Orexigen Therapeutics got a letter stating its Your Brain spot for obesity pill Contrave failed to include appropriate risk information. Bottom line: Be as open as possible and unless the clinical data says it explicitly, don’t even think about saying it. *The loophole that allows broadcast drug ads to exist — drugmakers dodge the lengthy “brief summary” requirement by making it easy for consumers to access the full labeling info elsewhere. They can add a “talk to your doctor about” proviso to their TV ads. Refer viewers to a print source (“see our ad in People magazine”) or add a URL where the full product label can be accessed. Share a toll-free phone number for patients to call for more info. **The gist of adequate provision is to accommodate individuals without internet access, concerned about being identified, or uncomfortable requesting additional information. It’s never really been an issue, say regulatory experts. Disease awareness remains among the quirkiest* areas of pharma marketing. The FDA has issued and withdrawn two separate guidance documents about disease awareness campaigns. Previous guidelines required that disease awareness ads include distinct visual and thematic elements and cannot be presented in close physical or temporal proximity to the branded campaigns. *If you had a basketball in your unbranded work, you can’t have any sports in your branded work. There’s a belief consumers are making these direct connections between advertising campaigns when, in reality, it’s so hard for them to even notice it. 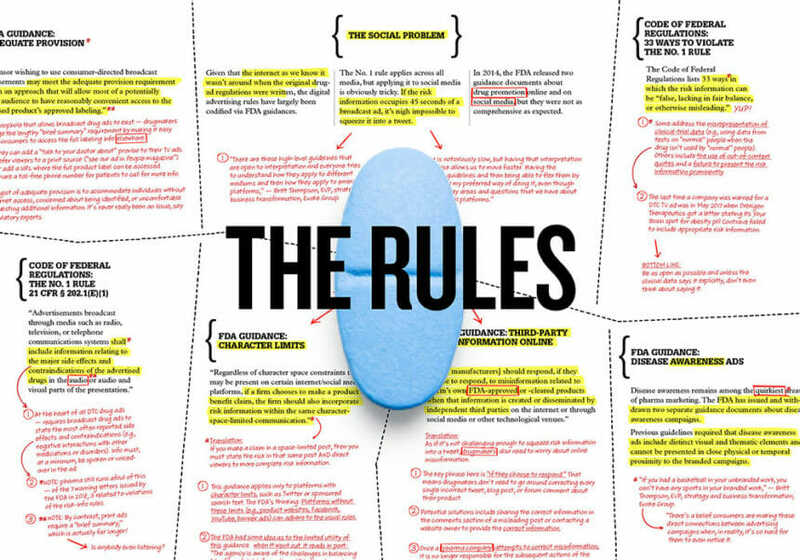 Given that the internet as we know it wasn’t around when the original drug-ad regulations were written, the digital advertising rules have largely been codified via FDA guidances. The No. 1 rule applies across all media, but applying it to social media is obviously tricky. If the risk information occupies 45 seconds of a broadcast ad, it’s nigh impossible to squeeze it into a tweet. The FDA released two guidance documents about drug promotion online and on social media in 2014, but they were not as comprehensive as expected. “There are these high-level guidelines that are open to interpretation and everyone tries to understand how they apply to different mediums and then how they apply to emerging platforms.” — Britt Thompson, EVP, strategy and business transformation, Evoke Group. *Translation: If you make a claim in a space-limited post, then you must state the risk in that same post AND direct viewers to more complete risk information. This guidance applies only to platforms with character limits, such as Twitter or sponsored search text. The FDA’s thinking: Platforms without these limits (e.g., product websites, Facebook, YouTube, banner ads) can adhere to the usual rules. The FDA had some idea as to the limited utility of this guidance when it went out. It reads in part: “The agency is aware of the challenges in balancing benefit and risk information within the character space constraints of certain internet/social media platforms — particularly in terms of content — because of the sheer volume of information.” So, uh, thanks? Translation: As if it’s not challenging enough to squeeze risk information into a tweet, drugmakersalso need to worry about online misinformation. The key phrase here is “if they choose to respond.” That means drugmakers don’t need to go around correcting every single incorrect tweet, blog post, or forum comment about their product. Potential solutions include sharing the correct information in the comments section of a misleading post or contacting a website owner to provide the correct information. Once a pharma company attempts to correct misinformation, it is no longer responsible for the subsequent actions of the original author. So if that person claiming your blood pressure drug cured their cancer keeps trumpeting its virtues, that’s not on you.